The new BMW 4 Series has received a lot of reviews for its performance and interior style. Many people have seen that the 4 Series has been rising up in the luxury car market for some time. It's not in the top 10 for luxury small cars, mostly for its performance and interior. The refresh gave the BMW a lot more features in infotainment, allowing for new safety warnings, diagnostics, and smartphone integrations as well. BMW has been fine-tuning its engines to provide more power even at the base. However, there are several trims that go up to the twin turbo 440i that provides the most power for the trim. You can also look at the Gran Turismo if you want a stylish exterior and roomy interior with tons of upgrades. Want premium leather? Then there is a premium package that includes all different colors from sienna to white stripe sport leather seating. 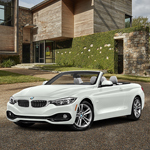 Try a new BMW 4 series with a test drive at Germain BMW of Naples.